Beyond Einstein takes readers on an exciting excursion into the discoveries that have led scientists to the brightest new prospect in theoretical physics today — superstring theory. What is superstring theory and why is it important? This revolutionary breakthrough may well be the fulfillment of Albert Einstein’s lifelong dream of a Theory of Everything, uniting the laws of physics into a single description explaining all the known forces in the universe. 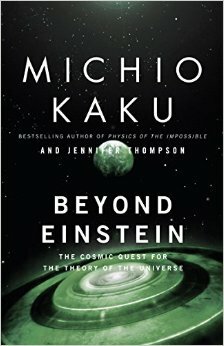 Co-authored by one of the leading pioneers in superstrings, Michio Kaku, and completely revised and updated with the newest groundbreaking research, the book approaches scientific questions with the excitement of a detective story, offering a fascinating look at the new science that may make the impossible possible. This entry was posted in Books and tagged albert einstein, michio kaku, theoretical physics. Bookmark the permalink.